Minik robots have been designed and developed in ISL. There are 5 Minik robots. They are differential type and have motion mechanisms. Low level motion control: Updated Arduino-based systems. The first version of vision system is integrated. Their vision system has been updated. Their processors are Rasperry Pi 3. 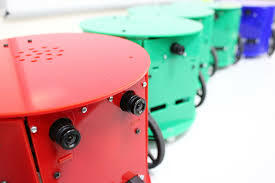 These robots are used in EE451 as part of final Project.